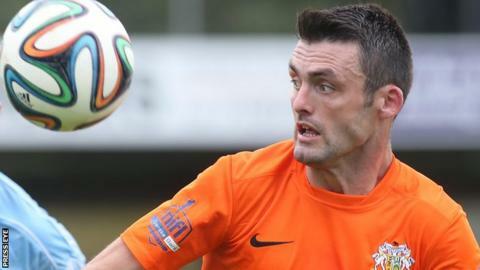 Glenavon striker Eoin Bradley could miss Saturday's league clash against Linfield after suffering a hamstring injury in a gaelic football match. Bradley sustained the injury and was sent-off while playing for Glenullin in their Derry club championship defeat by Dungiven on Sunday. He was a notable absentee from the Glenavon team which lost to Portadown in Saturday's mid-Ulster derby. No definitive explanation was given for his surprise omission. Bradley was a man in form after scoring two goals against Institute the previous weekend, a victory which took the Lurgan Blues to the top of the Irish Premiership. However, he did not feature in the derby defeat which came 24 hours before the Derry club quarter-final at Owenbeg.